Industrialization doesn't lead to disbelief. There are other factors which have to do with people becoming irreligious, but industrialization isn't one of them.﻿ As for what the factors are; I would say that materialism and the spread of communism in the past have been big factors in the spread of atheism. When people become secular, they tend to regard religion as a bad thing. Atheism has spread a lot in Europe and North America since the last 2 decades, but its spread is even bigger in Europe compared to the USA. The reason why it's more prevalent in Europe is probably because Western Europeans have a lot of bad stereotypes about Catholics. Those stereotypes may have come from the time when Napoleon launched a war against the church and its people. A lot of clerics were killed during that time, crosses were removed and France was kind of becoming an irreligious country at that time. In America, the implementation of secularism was executed without resistance. While in Europe it was the exact opposite. It may have to do with the fact that Protestants in America knew how to be secular and religious simultaneously. Hence why there are still a lot of religious people in America in comparison to Western Europe. I would also think communism has left a mark particularly in Eastern Europe, but communisms/socialisms legacy could have a religious or irreligious effect depending on how people react. I read what you said fairly quickly because I actually enjoyed reading it. Keep up the good OT posts. Uh, I think East Europe is actually more religious than West Europe. Atleast countries like Poland or the Czech Republic are. Poland is the most religious state in Europe. Czech Republic is the most irreligious country in the entire world. Everybody should have this map bookmarked. It is really fantastic. 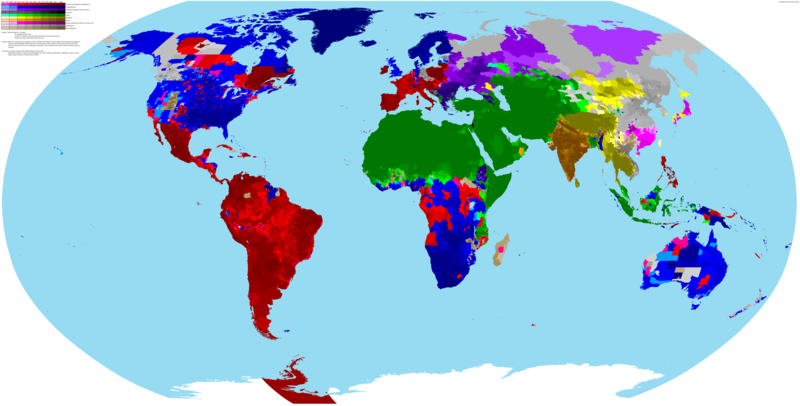 All the world religions and where they form a majority of the population. The only bad thing is that it doesn't show the Sunni-Shia split. In general, in eastern Europe the Church was vital in bringing down the iron curtain. Pope John Paul ll was zealously anti-communists and demanded his Catholics (mainly poles) to rise up against the state-sponsored atheism of the Soviet Union. Thusly, in modern polish/lithuanian culture being catholic is a sign of being anti-communists and Poles/Baltics today really hate communism. The Balkans are also at American levels of religious because it people in the Balkans look for things to divide themselves on. China is also very irreligious because of Communism. The map also shows why the border between lithuania and lativa and borders in the balkans lies were they do. Religious differences. Most European countries are separated either by language or religion. The borders are important. This is also a map of gay rights in Europe. 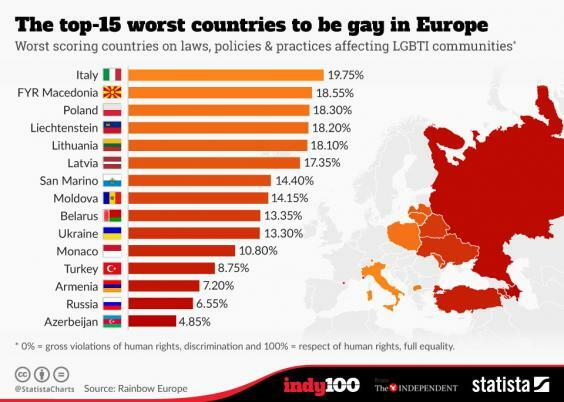 The 15 countries shown have the worst gay rights in Europe. Almost all are Eastern European. Notice that the heavily Atheist Czech Republic, Estonia, and moderately atheist Hungary do not show up even though they were behind the iron curtain. Czech Republic is the most irreligious country in the entire world. Oh damn, didnt know that. In North America too I'd say there are negative stereotypes of religious people, which in turn discourages religion. Some are seen mostly as backward, paranoid, or just all out hateful. East-Europe countries are very atheistic because of communist indoctrination into atheism since the youngest age. Similarly, very religious countries are because people are indoctrinated into being Christian, Muslim or Hindou. Parents, public figures, and countries tell you to be of X or Y religion, or to have none, 95% of the world chose its beliefs in that way. If you're born in Czech Republic, chances are you'll become atheist, if you are born in Saudi Arabia, probably Muslim, if you're born in Spain, Christian. It's all about being indoctrinated into believing something is. Almost no one look at other religions, faiths and beliefs (or disbeliefs) in an enough open way so that you can make your own choice out of long and rational thinking. Also the reason western europe has socialism and other left-wing influences more than east is because people actually lived under communism in east, also communism sounds great on paper so more people without any real experience with actual communism are drawn to it. East-Europe countries are very atheistic because of communist indoctrination into atheism since the youngest age. actually folk are even more believing in most of east Europe, it is just that there are more godless (though they are almost nowhere the majority). Not very long after getting freedom from communism, Tajikistan got into a bloody 5 year civil war, between secularists and Islaamists. In a country in which 4/5 identify with a faith and 61% call themselves "religious people"? I am also Czech and agree with the psykkoman''s description.